One day while Neil Gaiman was driving in England, he noticed a wall by the side of the road and imagined Faerie on the other side. He conceived the story of an American author visiting Britain who would discover the wall. Shortly after this, on the night he received a literary award, Gaiman saw a shooting star, and the idea for Stardust was born. Stardust was first released as an illustrated series in 1997 and then as a novel in 1999, which won an award from the Mythopoetic Society. A movie version in 2007 received favorable reviews. After my recent review of Gaiman’s 2013 novel, The Ocean at the End of the Lane, I realized I’d never seen the Stardust movie. It’s available for rent on iTunes, and I highly recommend it. 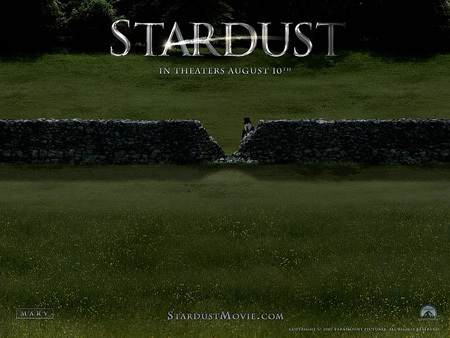 Stardust gives us the wall, a wonderful metaphor for much of human culture, erected to keep us out of Faerie, the realm of imagination, heightened emotion, wonders, terrors, true love, and our true selves. Responsible citizens don’t cross the wall. Tristan Thorn (Charlie Cox), a young man who lives in the town of Wall, is a classic dummling. He’s a klutz who can’t keep a job and is infatuated with Victoria, a girl who won’t take him seriously and whose finance delights in tormenting him. Yet Tristan’s father, who has been over the wall, says that might be a good thing – most people who find it easy to fit in “lead unremarkable lives.” Then he tells Tristan the secret of his birth on the other side of the wall. Tristan and Victoria see a shooting star fall into Faerie. Still infatuated, Tristan vows to bring the star back to win her hand in marriage. He forces his way through the wall to begin his search, but he is not the only one who saw the star. The murderous sons of a dying king in the realm of Stormhold set off to find the star when their father vows that the one who finds it will be his heir. And Lamia (Michelle Pfeiffer), senior member of a trio of witches joins the hunt – when stars fall to earth, the witches cut out their hearts and eat them, a little at a time, to preserve their youth and beauty. 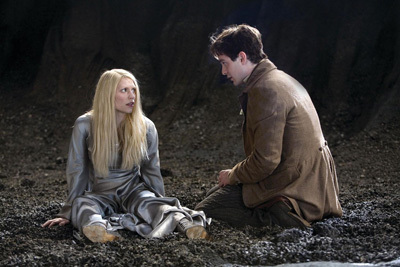 Tristan reaches Yvaine the star (Claire Daines) first. Still intent on winning the hand of Victoria back in Wall, he uses a Faire chain to compel her to follow him. 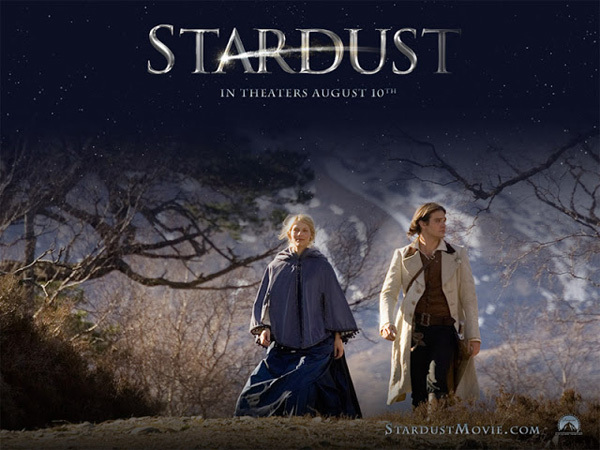 As with any good dummling story, the ending of Stardust will leave you happy. Though rooted in the sensibility of a modern coming of age tale, with elements of character development that the old traditional stories lack, Stardust fits Tolkien’s paradigm of the classic fairytale – the wonders and terrors we mortals encounter when we venture into other worlds. Faerie whispers to us in sunlight, in starlight, and in our dreams. Those intimations may be what make us most truly human. No wonder we have an endless appetite for wonder tales, and Stardust is one that thoroughly satisfies. This entry was posted in Fantasy, Folklore, Imagination, Movies and tagged Faerie, Fairytales, fantasy, imagination, movies, Neil Gaiman, Stardust. Bookmark the permalink. I love this movie! Thanks for the nice review. It was great to find it. I know I intended to see it when it came out but distraction(s) must have come up. I hadn’t heard of this one. For those with Showtime channels, it is scheduled several times this week. I have set it to record. Thanks for telling me about it. It sounds like something you would love. Maybe I will, too. I’ll be interested to hear your reaction.